Help! My dog's mouth stinks, Bowen Hills Vet. It may come as a surprise to you, but many owners do not check their pet's mouth regularly. Often when they do, it is because they notice that their pet's mouth stinks. It has been estimated that 90% of dogs and cats over 2 years of age have developed dental disease. The most commonly diagnosed form of dental disease is periodontal disease, which is an infection of the gums. 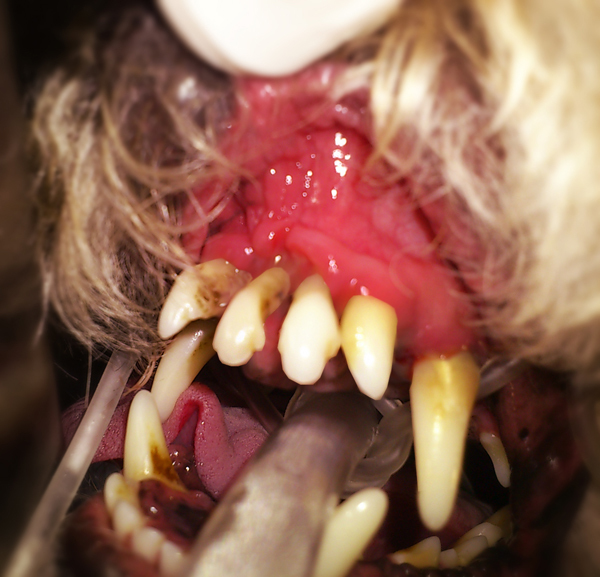 This is often caused by tartar - the buildup of food, bacteria and other residues on your pet’s teeth. Since your pet cannot brush his/her own teeth, tartar will slowly deteriorate your pet’s gum line and potentially allow bacteria to spread into the bloodstream. This can cause life-threatening diseases often involving the heart or kidneys. How do you know your pet may be suffering from dental problems, Bowen Hills Vet? Red, inflamed or bleeding gums. Plaques (yellow to brown color) build up on the teeth. Loss of appetite because it hurts whenever your pet eats. Your pet detests it when you touch his/her mouth. What can you do if you see any of these indicators, Bowen Hills Vet? See your local vet to determine if your pet has periodontal disease. Many clinics offer free dental checks by nurses so you don’t have to be out-of-pocket for any unnecessary fees. Stay tune for tomorrow's blog on treatments available for the smelly breath.